Courtesy Bill Bryan/John Jakob Raskob Knights of Columbus CouncilWorld War II veterans Walter Sitchenko and Buck Otis from Our Mother of Sorrows and Saint Peter the Apostle Parish, are members of the Knights council which organizes the annual flag laying event. 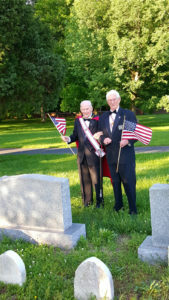 QUEENSTOWN – Veterans organizations and other groups place American flags on the graves of military veterans across the country for Memorial Day, but the Knights of Columbus have turned the flag laying into a ritual at St. Peter’s Cemetery and at Holy Family Cemetery in Church Hill. 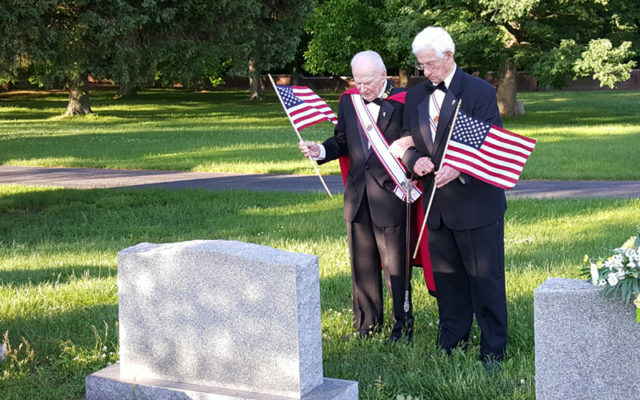 Members of the Knights of Columbus John Jakob Raskob Council gathered Wednesday for what has become a traditional Twilight Flag Laying Ceremony at St. Peter’s Cemetery. The ceremony featured the reading of names of more than 80 veterans interred at the two cemeteries operated by Our Mother of Sorrows Parish in Centreville, or who are buried elsewhere but members of families at Our Mother of Sorrows, St. Peter’s, or the Raskob council. The council began the flag laying several years after it formed in 2006, in part because many members are military veterans. That includes two current members who are World War II veterans: Walter Sitchenko and Buck Otis. 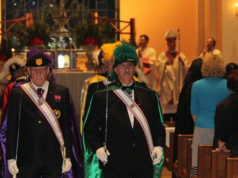 Once a Knights-only event, the ceremony was opened to all parishioners last year. Wednesday’s ceremony began with the Lord’s Prayer, followed by the Pledge of Allegiance and the playing of the Star-Spangled Banner, followed by the reading of names and Echo Taps. Martial music continued to play, including the hymns for each of the Armed Forces, as Knights and others fanned across the cemeteries to replace old American flags with new ones just in time for Memorial Day, which is observed on Monday. Another reminder of Memorial Day will come at all weekend Masses at St. Peter and at Mother of Sorrows churches Saturday and Sunday. Zach Groseclose, the grandson of a Knight, will play Taps at each Mass, at St. Peter’s at 5:30 p.m. Saturday and 7:30 a.m. Sunday, and at Our Mother of Sorrows at 9:15 and 11:30 a.m. Sunday. 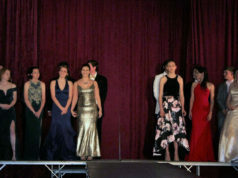 He began as a fifth-grader and has continued the tradition since. For Bryan, who comes from a family that has had military veterans in each generation since the Revolutionary War, the importance of Memorial Day weekend was etched into his mind as a child. He accompanied his father to cemeteries as far away as Arlington National Cemetery and in Baltimore, and to various cemeteries on the Eastern Shore, to honor fallen veterans. The flag laying continues that heritage “to honor all those who have faithfully and honorably served our beloved country,” he said.